August « 2015 « They Said What? Also, in our upcoming debate, he needs to defend the indefensible proposition that wellness saves money, when – as his co-authored HERO report shows – he can’t even defend that proposition against findings in his own report. Likewise, he will have to explain how, even though he’s sure wellness saves tons of money, he won’t attempt to claim a $1 million reward for showing it merely breaks even. Second is their ethical leadership: when Koop Committee members bestow Koop Awards upon their own customers (meaning themselves), a la Nero and the Olympics, their press releases never mention that they sit on and/or sponsor the Committee. Specifically, Dr. Goetzel now has to explain an employee of one of the most respected organizations ever to be represented on that committee (some might argue the only respected organization on that committee other than Procter & Gamble), just came out against wellness. Jim Lee, Vice President of the Altarum Institute, just wrote a blog post to that effect. Note: Jim Lee’s views represent his own, not Altarum’s, but you don’t see anyone at Altarum rushing to rebut him. To put this in perspective, this is equivalent to the time Reagan’s budget director, David Stockman, spoke out against Reagan’s economic policy. Tip O’Neill would be expected to oppose it…but David Stockman? He was exiled as a result. By way of background, Altarum is a nonprofit whose motto is: “Systems research for better health.” We urge people to visit their website to learn more. Dr. Goetzel apparently didn’t foresee that if you invite an organization known for its integrity onto your board, there is always the chance that members of that organization — acting on their own (as in this case) or on behalf of the organization — will demonstrate, well, integrity. We have noted often that integrity–and its cousins, facts and validity–are the wellness industry’s worst nightmares. Altarum is not the first organization where an employee of a member organization didn’t toe the Koop Committee line. Another (current!) Koop Committee member, Debra Lerner, also questioned the value of wellness. Specifically, Altarum Vice President Jim Lee, writing on his own blog (not the “official” Altarum website — these are his own views) cited the pro forma annual wellness visit to the doctor as an example of “low value care.” I urge you to read the full posting rather than just the highlights below, because in all fairness, his criticism is a bit more muted than the highlights might imply. He does say that he personally found value in that visit—though he noted he ended up back at the doctor for a real reason two weeks later and covered the same ground, thus making the actual “wellness visit” superfluous. Yes, we know it’s not always about us, but too bad he didn’t know about Quizzify – he could tell his HR department to offer that instead, so that employees could still get their $200, but by actually learning something useful about how “just because healthcare doesn’t mean it’s good for you.” Altarum wouldn’t even have to drop wellness, just offer both options side-by-side and see who takes which and which one actually works. Plus, every time someone opts for Quizzify over wellness, the savings are immediate owing to Quizzify’s much lower price tag. And that’s even before counting Quizzify’s savings guarantee, which no wellness vendor dares match. As for Ron Goetzel and his Koop Committee? In all probability, they’ll probably ignore this mutiny (hence their moniker “the leaders of the wellness ignorati”). Otherwise, I don’t know they could spin this one, though perhaps they could hire a consultant to advise him. I hear David Stockman is available. And don’t forget to vote in the poll before the line gets too long. I’m the underdog, it would appear. However, borrowing a page from wellness math, only a minority of people think Ron is going to win, so that means I’m ahead. As Wellsteps just showed, in wellness, there is no requirement that numbers not totally contradict themselves. It’s at the Population Health Alliance Annual Forum. It’s not officially announced yet but save the date. More details to follow. As our regular readers know, we have often had a very slight issue with Wellsteps’ math Nothing major. Just the fact that it’s completely made up. There is a bit of irony in that this Wellsteps White Paper cites him several times…but somehow “forgot” to take account of Dr. Edington’s most important finding, which coincidentally disqualifies their own. So which is it? Did overall population costs go up or down? 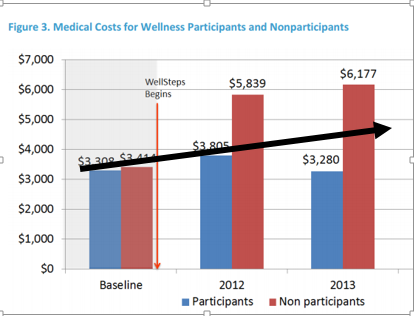 Even using wellness math, which Wellsteps excels at, overall population costs can’t have both gone up and gone down at the same time. (4) The number of employees in the school district declined, making it possible for total costs to decline even as costs/employee jumped. However, even the most dishonest wellness vendor wouldn’t claim credit for that, and even the most gullible customer wouldn’t let them if they did. One explanation we can rule out: Wellsteps is doing a great job and telling the truth about it. But anyone who knows this outfit could have ruled out that possibility before we even posted this. *Wellsteps didn’t mention the participation rate, so we are inferring a participation rate to the vector of this arrow based on them saying 60% were overweight of 3269 employees, but the number of overweight people listed in their report as participants is 1421. …as long as you have your checkbook handy. They do, however, recommend a background in sales, finance, or municipal administration. WELCOA has very high standards, as we have noted on They Said What. One thing they excel at is spelling the name of their founder, assuming their founder invented the all-you-can-eat self-service restaurant. 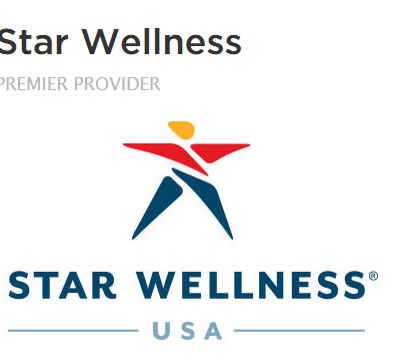 A commitment to excellence, like that displayed by Star Wellness and WELCOA, might explain why employers have gone all-in on the notion that teaching employees, for example, to drink eight glasses of water a day will reduce healthcare costs, and also increase productivity, at least between trips to the water coolers and the rest rooms. You’d learn far more than the typical wellness vendor knows about wellness simply by taking the Quizzify quiz. You’d learn more just by taking the demo quiz on the landing page. Heck, you’d learn more just by reading the Quizzify landing page itself. Mark Twain Explains Why Wellness Endures Despite TheySaidWhat? OK, OK, we admit we’re a little light on content this week. (And thanks to Chris Davis for posting this image.) We’re waiting for a REALLY BIG announcement. The wellness-meets-Roger and Me debate we’ve all been hoping for is GOING TO TAKE PLACE. Watch this space. The date, venue, rules etc. have all been agreed upon and the sponsoring organization is just finishing up the press release. We are getting very frustrated with the failure of wellness advocates to show even the slightest net savings using a legitimate methodology. Therefore we are offering a million-dollar reward for the first person who does. To win this reward, there are specific rules that must be followed regarding data sources and the selection of panelist judges, all listed below. 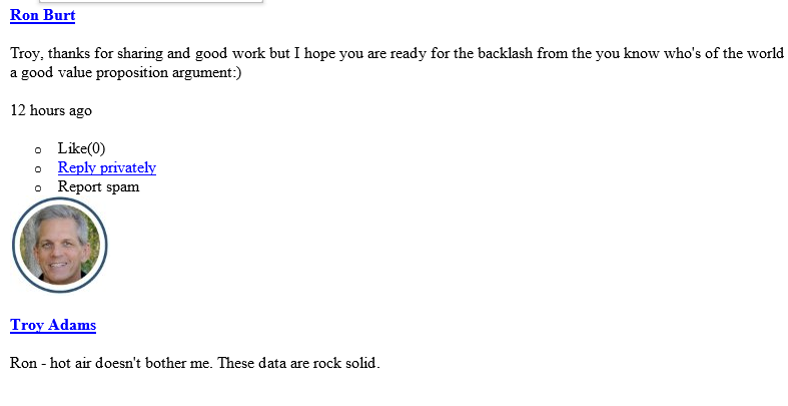 Recently a group calling themselves the Global Wellness Institute Roundtable put out a press release and report criticizing us for “mud-slinging on ROI.” We are not familiar with this group. Their headliner seems to be a Dr. Michael Roizen, head of the Cleveland Clinic’s much-vilified wellness program. If that name sounds familiar, it’s because he used to work with Dr. Oz, though to Dr. Roizen’s credit, he avoided the Congressional investigation of Dr. Oz. The report says we “impose a standard of evidence that doesn’t exist for any other workplace investment.” Um, like it needs to break even? Wouldn’t a company go bankrupt pretty quickly if it didn’t insist that its investments should break even? Also, there are three very specific reasons why wellness needs a high “standard of evidence.” If Dr. Roizen doesn’t understand these reasons, he can get a smart person to explain them to him. We get a little frustrated when we prove something, and then members of the wellness industry dress themselves up with words like “Global” and “Institute” and “Roundtable” and then say things like: “critics are misusing ROI science to castigate…workplace health efforts.” Then they cite articles that inadvertently undermine their own arguments and support the critics. They also say things like: “93% of the workplace wellness return in the first year is in productivity gains, not reduced cost.” This is squirrelly even by the lax standards of wellness math. No company can measure its productivity gains with that precision. Still — assuming you exclude time wasted in filling out forms, being screened, and getting unnecessary checkups — maybe they’re right. After all, nothing focuses the mind on work-related issues like being told you’re sick. And yet casual observers assume there are two sides to this “debate.” It doesn’t help that journalists need to print opposing quotes. However, pry, poke, and prod” wellness loses money, period–unless you count the money forfeited by employees who don’t participate, or don’t lose enough weight to earn their payment. Those payments are not counted for the purposes of this reward since they are transfers, not savings. Leaving out employee forfeitures, the country as a whole has not even remotely approached breaking even on wellness spending vs. claims costs. But don’t take our word for this. We are offering a million-dollar reward for anyone who can show that it is more likely than not that “pry, poke, and prod” wellness breaks even through healthcare claims savings. The so-called “best programs” in the country — Koop Award winners the last 3 years — are, if not exemplary, then at least good performers that earned the savings they claimed to save, by significantly reducing risk factors. Here are the rules. This is a binding legal contract. We can’t offer something like this and then say we had our fingers crossed. You need to start out with a lie detector test, to be performed by the Boston police, as I will. The questions to be asked are: “Are you telling the truth?” and “Is the opposing party either deliberately lying, and/or has no clue how to measure outcomes?” Either side may submit either or both sides’ results, as they prefer. You must provide your view of the C. Everett Koop Award to Wellsteps and Boise (600 words, 6 hyperlink maximum), and rebut the other view (600 words, 6 hyperlink maximum). We will also both be asked: “Did the Wellsteps program reduce costs in Boise by roughly a third, as they claimed?” in the lie detector test. In order to facilitate your quest, you can use include the wellness industry’s own HERO Outcomes Guidelines, which represents the “consensus” (their word) of 39 “subject matter experts” who support wellness. (None who oppose wellness were invited to participate.) 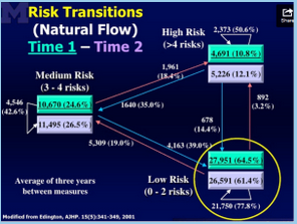 US Census Bureau information, Kaiser Family Foundation, and the AHRQ’s HCUP database can also be used. Other databases will be allowed in at the discretion of the panelist judges if they deem their probative value to be very strong. Once an article is brought into the discussion, the opposing party may also cite it in cross-examination. We give you a lien on $1,000,000 as soon as you escrow $100,000 to cover the costs of the program (honoraria for panelists, venue etc). The loser pays this (meaning that if you win, you get it back). If the costs are less than $100,000, the winner keeps the difference. We each pick four panelists from Peter Grant’s “A-List” of the leading 260 health economists and policy experts (this is an invitation-only email list in which health policy and health economics concerns are addressed and debated) that are unaffiliated with the wellness industry or with Quizzify . Each party can veto two of the other’s picks. Together, the remaining four pick a 5th. The material linked must predate the claim for the award by 6 months, in order to discourage either side from creating linked material specifically for this contest. Each party may separately cite previous invalidating mistakes made by the other party that might speak to the credibility of the other party. Either side may cite an unlimited number of “declarations against interest,” made within the last 4 years–meaning comments made by the other party so prejudicial to their own position that the other party would only have said them if they were true. Example: if I said, “Wellness definitely saves money” (except when I said it as an April Fool’s gag), you could cite that. There is no word limit on these. Each party can then rebut the other party with up to 2000 words and 5 graphs, and 20 links. The parties will be convened, in Boston (or another agreed-upon city, if the other party is willing to pay my travel expenses), for a two-hour finalist presentation in which the panelists (whose travel expenses and professional charges are paid for out of the entry fee) can ask questions of either party, and both parties can cross-examine the other for up to 40 minutes, with followup questions and no limitations on subject matter. Each party can make a 10-minute opening and 10-minute closing statement. Up to 20 slides are allowed. During their 40 minutes, each party that has not achieved Certification in Critical Outcomes Report Analysis by the Validation Institute must explain why they haven’t, and each party that has not signed the Employee Health and Wellness Code of Conduct must explain why they haven’t. We invite the wellness industry leaders — the “Global Wellness Initiative Roundtable,” the Koop Award Committee, and the Business Roundtable (BRT) and of course the Health Enhancement Research Organization — to collect their million dollars. Or shut up.